CNG: eAuction 438. MOESIA & THRACE. Æ (31mm, 17.72 g). 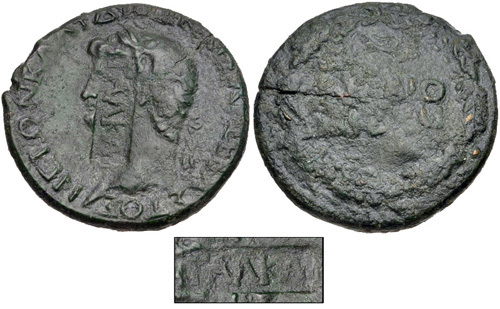 Struck during the reign of Galba, April–June AD 68. 438, Lot: 343. Estimate $150. MOESIA & THRACE. Æ (31mm, 17.72 g). Struck during the reign of Galba, April–June AD 68. ΓAΛ • KAI in rectangular countermark on a Greek-legend Perinthus mint bronze of Nero. Pangerl 93; Howgego 527. Host Near VF, c/m Near VF, green patina, stress crack.